Being the child of Holocaust survivors I have been exposed to the reality of what took place from the time of my earliest memories. Naturally my understanding of the events developed as I grew older, but from a young age the one thing I knew was that my parents went through something not everyone else’s parents went through. I never knew my grandparents. My mother’s mother passed away many years before the war, but her father and my father’s mother and father were all killed in Auschwitz. As I grew up I went through this stage where I thought that my parents had a pretty easy go of it in the war. After all, they didn’t have numbers on their arms and my mother was never even arrested by the Nazis. How bad could it have been? That stage did not last long as I soon began to gather a more educated understanding of my parents’ experience. I believe it started with me trying to imagine the relatives I never knew. I would think of my father’s parents. Listening to the stories my father would tell, I would always feel a special connection to his father. One I could not explain rationally or logically. I just felt a somewhat mystical bond. His mother would seem to me like a woman with a quiet demeanor but strong willed character. My father would always speak with them with nothing but respect which inevitably would translate to how I and I presume the rest of my siblings would perceive them. I would then try to imagine my mother’s father. He always seemed like the man everyone wanted to meet at least once. He was an athlete, outgoing, successful in business, while being somewhat mysterious. At least that would be how it looked through my young eyes. And then I would think of my mother’s brother and all I would see was a sweet, talented, and gentle young man who should have had a chance to live in an easier time. I knew my mother loved them both deeply and that remembering them was more emotional than almost anything else. I would imagine all of them and try to picture them. How they lived, how they spoke, how they might have spoken to me. At one point however I realized that when imagining them my imagination never left Amsterdam. I could not imagine them being picked up in a raid and stuffed on a train to ultimately wind up in Auschwitz. And I most certainly could not imagine them being killed in the gas chambers. I could not imagine any of this. It was just too difficult. And I never even knew them. 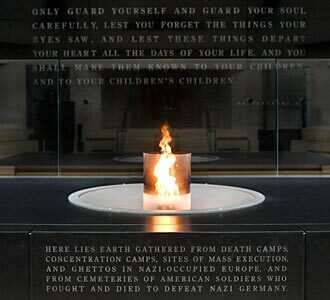 It is hard to conceive the horrors experienced by the murdered victims of Nazi Germany. Of the 6 million Jews who were murdered during this time, many were tortured, beaten, raped, used for experimentation, and made to suffer in ways that a normal mind cannot even begin to conceive. And for those who experienced this level of suffering and survived, to make an attempt to comprehend what they felt would have to be impossible. True, my parents did not have those specific experiences. What they had to endure was running from an enemy that would certainly kill them, hiding in whatever location they could find regardless of the conditions, being so deprived of food that fresh bread and butter seemed like a luxury, and finding out that almost everyone they knew, loved, played with, studied with and laughed with, was gone. Taken away forever. Earlier today I closed my eyes and tried to imagine being in a New York where 75% of the Jewish community was gone and in a world where the majority of my family was suddenly dead. I could not do it. It was just too difficult emotionally. For my parents and for so many like them, they did not have the luxury of opening their eyes and going back to a better reality. The reality was brutal and would never ever be altered. All it could be was remembered. The Holocaust the Jewish people suffered through was of such an enormous magnitude that the people who went through these horrors on whatever level they did are called survivors, when in fact they too were victims. There are various factors that have contributed to the survival of the Jewish people since the horrors of Nazi Germany. A case can be made for any one of many reasons being most important. Some would say it is the existence of the State of Israel, while others might say the commitment of the Ultra-Orthodox or the traditional Jew, while others may say it is the activist who will fight either physically or verbally in defense of the Jewish people. One thing is certain. It is not because of the person who does nothing. Until recently I considered myself one who did nothing. Although I have always been proud to be a Jew, I’ve never felt like I did enough. On this eve of Yom HaShoah, I feel a responsibility like never before to be a voice that reminds people of what happened and to fight those with the gall to claim it never did. It may be too painful for me to imagine, but it is even more painful to my soul to allow myself to ever forget. This entry was posted on Wednesday, April 18th, 2012 at 12:24 am	and tagged with Amsterdam, Auschwitz, gas chambers, Germany, Holocaust, Jewish, luxury, Nazis, State of Israel, Ultra-Orthodox, Yom HaShoah and posted in Uncategorized. You can follow any responses to this entry through the RSS 2.0 feed. Reblogged this on Holland's Heroes.